So, it’s 2014! I honestly can’t understand where the last twelve months have gone. On paper, I think 2013 was a pretty good year for me – I stuck to my resolution to take more risks – but I can’t say that it was an enjoyable year. It was all a bit unstable and uncertain and I didn’t like it. Many people would label me as a control freak, which is probably fair. But for me, I just need to have stability in one part of my life in order to feel secure – I don’t need to be in control of everything, just one thing, and then I can deal with everything else. And this… I mean LAST year, I didn’t feel I had that at all. Rewind to the start of 2013. I’d applied for over 20 jobs and had been invited to interviews for only two of them. I had kind of checked-out of work, and for the first time, genuinely dreaded going into the lab. I had become much better at being less tough on myself, and become less-self-critical in 2012, but by early 2013, my confidence had taken a hit – why didn’t anyone want to employ me? – and I was feeling trapped in a job I knew wasn’t for me. Myself and my boyf moved in together to an area relatively new to me, and there were struggles with that (two fiercely independent people + 1 bed flat = friction). And then in May I was offered a new job, just the kind of stepping stone I’d been looking for, and in June I handed in my notice. By the time I left NPL, I had regained some of my self-confidence – I realised that was employable and discovered that I’d made a real, positive impact on my collegues and friends at the lab – and was feeling ready for the challenge of a new job. Other stuff had started to slip though – I wasn’t making much of an effort with my friends, always too busy, and I stopped going to dancing so I put on weight. My relationship had hit a really rocky patch AND my 30th birthday was approaching. And we had to go flat-hunting AGAIN. I really wanted to see the back of 2013. I can now look back at the year and see that it was actually fine. My confidence is still a bit wobbly, but I’ll get there. My family are all still wonderful, and very happy and healthy. My relationship seems to have survived the worst and is feeling good again. My lovely friends have forgiven me. My biological clock has remained firmly off despite my new-found grown-up status. I visited a few new parts of the world in 2013. My new job has been mostly good, and I was involved in some very interesting projects. We moved into a cosy new flat that already feels like home. I’ve even lost weight (yes, even over Christmas!). I finally sorted out my finances and even started saving properly. And a couple of months ago, I was offered an opportunity to do something I’ve always secretly wanted to do (more on this at a later date). So I REALLY shouldn’t moan. I actually have it pretty good! I’m entering 2014 rather cautiously, feeling a bit battle-scarred after a year of too much change. One of my FB friends shared this pic yesterday, and I liked it so much, I stole it. 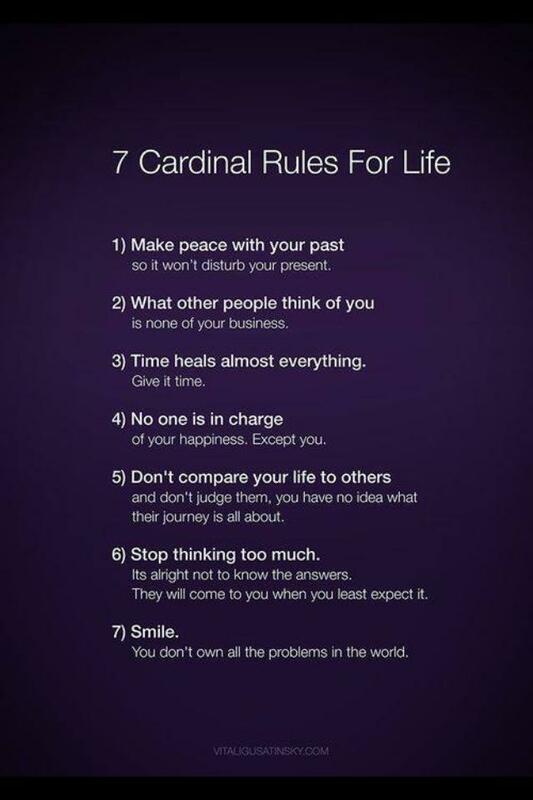 Here’s how I will endeavour to live in 2014 (#6 should be a particular challenge for me!). Oh dear dear. Good luck in 2014.